Paneer Butter Masala is a yummy & irresistable dish for all those who love paneer...!!! This popular Punjabi recipe made from Indian Cottage cheese / Paneer with smooth gravy, has all the goodness of delicious spices. This creamy and light buttery flavored dish is a easy and quick recipe, without compromising on the taste. In this recipe, soft paneer chunks are dunked in a rich gravy, due to butter and is thickened by using onions, tomatoes and cashew paste rather than just cream. Its apt like the restaurant gravies. 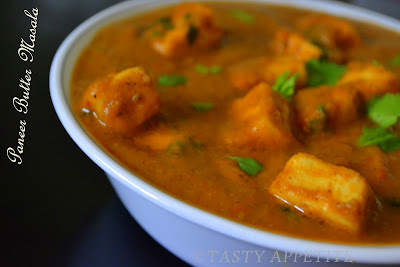 We love this with a combo of chapathi & roti and I have enjoyed cooking this several times..! Heat a tbsp of ghee in a skillet. 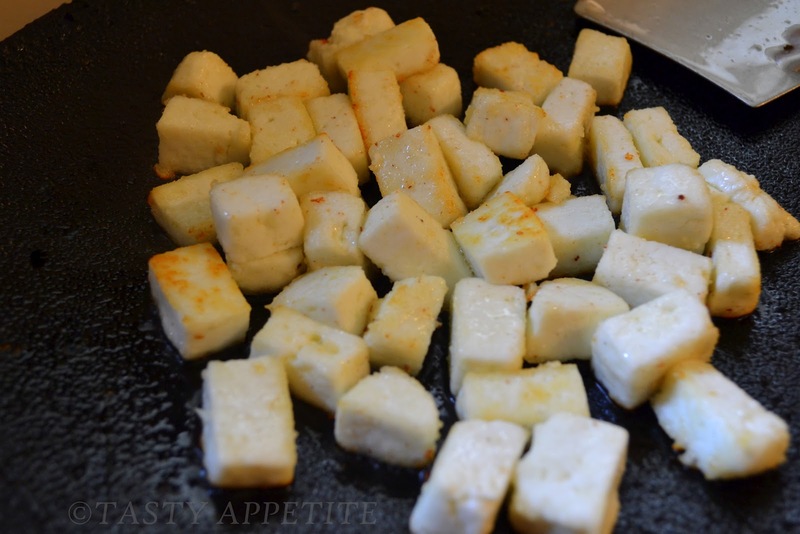 Saute the paneer cubes in it till golden. Now add finely chopped onion and saute till it is glassy. Add chopped tomato and fry till soft. Allow to cool and grind them to smooth paste. Add 2 tbsp of butter to the fry pan and heat it. Add the bay leaf and the cloves. Add onion tomato paste and saute till light brown. Saute for 2 to 3 mins. Add red chilly pwd followed by the cashew paste. Fry for 5 minutes in low medium flame. Add crushed kasuri methi, coriander pwd, food color, turmeric pwd, garam masala and salt. Stir and let it simmer for sometime. Add the paneer cubes and simmer for 4 to 5 mins. Add a small cup of water and let it cook on low heat till you get the desired creamy consistency. Remove from flame, stir in remaining butter and fresh cream. Serve hot with any bread of your choice, pulav or Jeera rice. 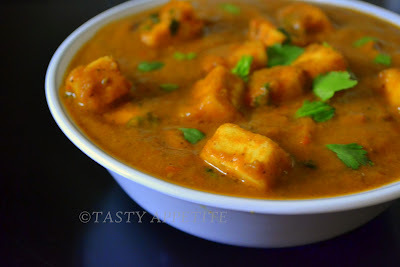 Delicious Paneer Butter Masala is ready to relish. wow... love this dish jay... lovely clicks... just am drooling over it!! Love the rich color, awesome.. I am DROOLING !!! ;D I love cheese and that paneer looks yummy though I haven't tasted it yet :P ;D This rich and hearty dish looks fantastic ! Easy to follow and very tempting Jay! great post! love your organization of photos and directions. anything with paneer in it is great in my book! Great pics! This is mouthwatering! Love it totally looks awesome. I just finished a whole plate of curry, and looking at this makes me want to dive right in for more. Thanks for the follow. We are new followers of yours! Definitely restaurant style!! Looks super yummy!! thanks for your precious time & lovely feedback..
yummy....its simply mouthwatering. such a delicious recipe ...beautiful click too!!! That looks amazing! Craving that right now! Never tried Panner have to look that up. delicious and mouth watering gravy. 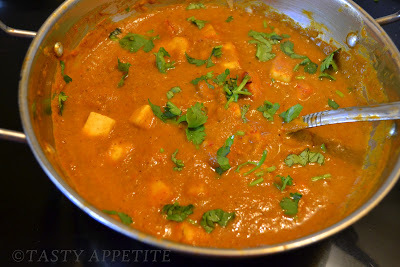 Nice and inviting paneer butter masala !! Can't as for more from delicious Paneer..Thick and creamy. My favorite!! Love the look of it and the lovely color! 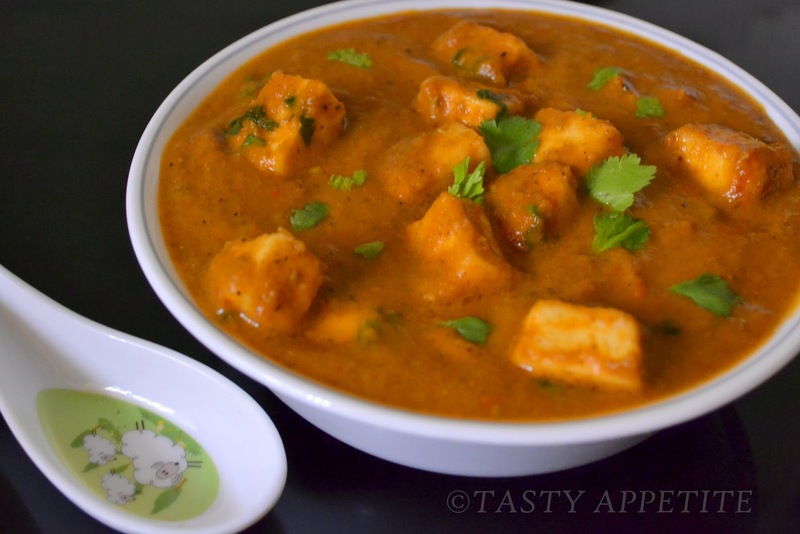 Yum yum yum, paneer is my absolute favourite and this looks so delicious mmm! It looks wonderful, I see this type of cheese do not melt :) Have a nice weekend! Awesome Just what my fussy eaters will love. 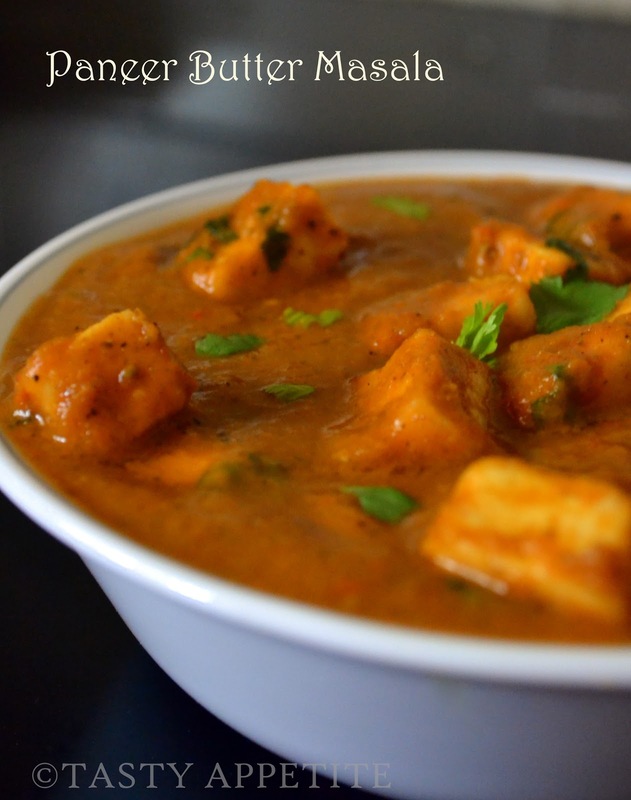 Wow exquisite paneer butter masala jay. Looks real rich and absolutely classic. 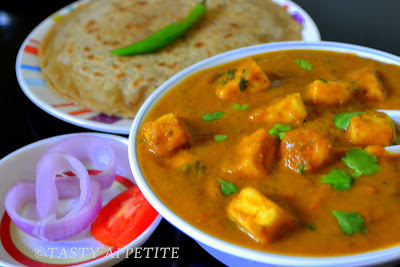 the paneer butter masala looks super delicious dear...yummy ! Yum, I'd like some rice with that please! This looks absolutely like a rest bought :) Lovinggggg it!!!!! Fabulous Clicks Jay!. Paneer Makhani luks awesomely inviting!. So deliciously presented! oo this looks so good! 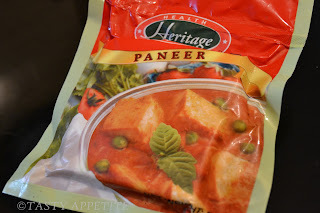 i wish i knew where to buy paneer near me :( i will just have to dream about making it! Ho tradotto la tua ricetta e letta con interesse!! Il paneer non lo conoscevo ma ho letto il sistema per farlo in casa. Ricetta deliziosa per me che amo le spezie e gli aromi!!! Grazie del tuo passaggio da me. Non perdiamoci di vista!! looks perfect and creamy masala...first pic looks superb! one of the most luved dishes...!! !nice post...and pics...yummm!!! ohh ! Can I come over for dinner tonight , How amazing this will taste with Naan .. I can definitely see from the pics that this is for sure yummy and oozing with so much of taste. 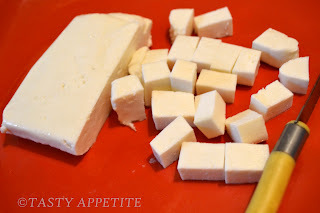 Absolutely love paneer - looks like the perfect recipe for it! Thanks for sharing authentic Paneer recipe. Fabulous clicks. Looks divine and the color...wow! Such a rich and tasty dish, thanks for the recipe! I am a student in the UK and your blog has been a life saver of all the lovely Indian recipes you got in one place. I told my friends and we all follow it. :) Thanks so much. Just one thing, I can't find paneer anywhere in London, any idea where I can find it, I live in the central London. Can't go far. Hi - thanks for the great post. This was lovely - tried it once with Paneer and once again last night with just corn and capsicum - it will always be one of my favorites! Thanks. Pls tell me what kind of tomato you have used, country or Bangalore one? I used Bangalore tomato but my PBM was little bland. I used country tomatoes that are well ripened n juicy.